Joel W. Plummer, 70, of Mt. 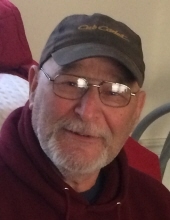 Pleasant formerly of Lapeer, died Wednesday March 20, 2019. He was born October 28, 1948 in Lapeer to parents Charles and Mabel (Spates) Plummer. Mr. Plummer was a very hard worker; he owned and operated J & B Used Cars in Lapeer then in Mt. Pleasant, where he repaired, did body work and sold cars. In his free time, he kept busy racing motorcycles or long road trips. Joel enjoyed going to cars shows and reconditioning antique cars. His family said he liked to tell jokes, worked a lot and was always goin’, goin’. Mr. Plummer is survived by his daughter: Molly (fiancé, Brian Jenkinson) Plummer of Lapeer, granddaughter: Dixie, sisters: Sally Plummer Metz and Joan (Paul) Cohee. He was preceded in death by his siblings: Sherry McCauley; Craig Plummer; Kathy Bincsik as well as his parents. Joel’s funeral will be Saturday March 23, 2019 11:00am at Muir Brothers Funeral Home, Lapeer. The family will receive friends from 9:30am-11:00am prior to the service on Saturday. Cremation will follow services. "Email Address" would like to share the life celebration of Joel W. Plummer. Click on the "link" to go to share a favorite memory or leave a condolence message for the family.